The Reds have signed backstop Tim Federowicz to a minors deal, per the MLB.com transactions page (h/t to Chandler Rome of the Houston Chronicle). Indeed, the veteran has been with the organization for a few days already and is active at Triple-A. Federowicz, who recently turned 31, spent some time in the majors this year with the Astros, but was cut loose in late July. This represented the seventh campaign in which he has seen some MLB action. Overall, Federowicz is a .197/.244/.311 hitter in 353 plate appearances at the game’s highest level. Despite those struggles in limited opportunities with the bat in the majors, Federowicz has been a productive hitter at times in the upper minors. Indeed, he has produced .800+ OPS marks in each of the past three years at the Triple-A level. In 151 plate appearances at the Astros’ top affiliate this season, he produced a hefty .328/.404/.560 batting line. The Astros have struck a deal with the division-rival Angels to acquire backstop Martin Maldonado, as Jeff Fletcher of the Southern California News Group first reported (via Twitter). Young lefty Patrick Sandoval will go to the Angels along with $250K in international pool money. With the move, Houston has bolstered its catching unit as it awaits the return of veteran Brian McCann from the DL. 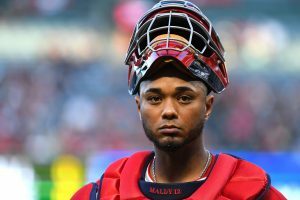 Maldonado will displace Tim Federowicz, who has been designated for assignment, per Jake Kaplan of The Athletic (via Twitter). The Astros’ new catcher will pair with the emergent Max Stassi to split up the work behind the dish for at least the next several weeks. Maldonado is earning $3.9MM this year before qualifying for free agency at season’s end. He originally came to Los Angeles in the deal that sent fellow receiver Jett Bandy to the Brewers before the 2017 season. Over the past two years, Maldonado has performed at the plate much as he did in his prior MLB action. He’s a weak on-base threat who only partially makes up for that with some pop. For his career, Maldonado owns a .219/.291/.347 batting line — good for a 72 OPS+ that he has matched almost exactly in both 2017 and 2018. Clearly, the appeal lies more in Maldonado’s work with his gear on. The 31-year-old is a well-regarded all-around performer behind the dish. In particular, though he has not earned prime grades for his framing in 2018, Maldonado has in years past rated as one of the sport’s best at winning strikes for his pitchers. If nothing else, the addition of Maldonado will give the Astros some much-needed insurance with McCann still working back from a knee surgery. Just how things will be sorted out in the postseason remains to be seen, but the Astros will surely feel confident they’ll have solid options available the rest of the way. Meanwhile, the Halos are more or less acknowledging the obvious: this won’t be the year they break back into the postseason. The 21-year-old Sandoval represents something of a consolation prize for a disappointing campaign. Sandoval was an 11th-round pick in 2015. He has turned in an impressive campaign thus far, working to a 2.56 ERA in 88 frames — most of them at the Class A level but his more recently at High-A. Sandoval has struck out 9.9 and walked just 1.5 batters per nine on the year. Baseball America recently wrote up the young southpaw, characterizing him as a legitimately interesting prospect. Fletcher tweeted Sandoval’s inclusion. Joel Sherman of the New York Post (via Twitter) and MLB.com’s Mark Feinsand (Twitter link) had the international money. The Astros announced that catcher Tim Federowicz has been outrighted to Triple-A after clearing waivers. Federowicz was designated for assignment two days ago when Brian McCann returned from the disabled list. After signing a minors deal with Houston in the offseason, Federowicz appeared in two games for the Astros while filling in during McCann’s brief DL stint, and he’ll continue to provide organizational catching depth. The Diamondbacks have outrighted infielder/outfielder Kristopher Negron to Triple-A Reno, per an announcement from Arizona. Because Negron has been outrighted in the past, he could reject the assignment in favor of free agency, but it seems he’ll stay with the Diamondbacks. Negron lost his spot on Arizona’s 40-man roster this week when the team designated him for assignment to make room for the addition of outfielder Jon Jay. Prior to that, Negron collected 34 plate appearances with the D-backs dating back to last season (including three this year). The 32-year-old has otherwise played with Reno since 2017. The Orioles’ Triple-A team in Norfolk announced that it has released left-hander Jason Gurka. Now 30, Gurka has spent the majority of his pro career with the Orioles, who chose him in the 15th round of the 2008 draft. Although, all 18 of Gurka’s major league innings have come with other teams (the Rockies and Angels). After spending last year with the Halos, Gurka returned to the O’s on a minors deal in the offseason and began 2018 with 22 2/3 innings of 3.18 ERA ball, with 9.53 K/9 against 2.38 BB/9, at Norfolk. One day after they released catcher Trevor Brown, the Giants have brought him back on a new minor league deal, Alex Pavlovic of NBC Sports Bay Area tweets. Brown will return to Triple-A Sacramento, where he has hit .222/.344/.259 in 32 PAs this season.